"Feathers, for jazz quartet. LP: Eric Dolphy, alto saxophone; Ron Carter, cello; George Duvivier, double bass; Roy Haynes, drums New Jazz NJLP-8252 & Prestige PR-7652 & Prestige 24008 & Prestige tapes M82408DP & M52408DR & Esquire 32-153 & Xtra 5054 (1960)." This is a wonderful composition. 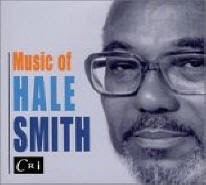 I just thought I'd note that Hale Smith told me the title was Feather. He wrote it for the Chico Hamilton Quintet.